:only domestic (Korean) credit cards are acceptable for purchasing tickets. Direct KTX operates 7-8 times a day but more frequent trains with transferring at Seoul Station are available (Travel Type: Transfer). COURSE 4 is the same with the transferring route in COURSE 3 except for taking the Airport Express to Seoul Station. 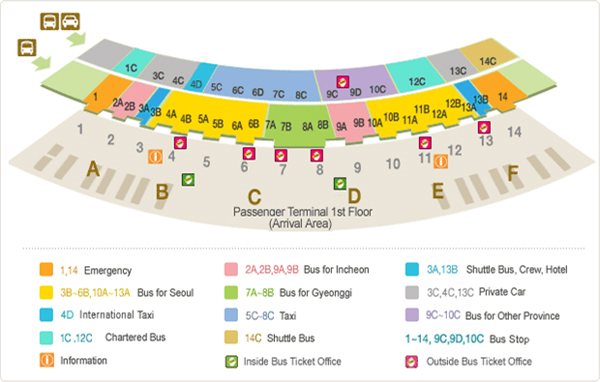 Purchasing Limousine Bus tickets to Dongdaegu at the Bus Ticketing Office located at Exit 4 (Outdoors) or 9 (Indoors), and Taking a Limousine Bus at 1st Floor Bus Stop 10C.